Gingrich Attracts Jubilant Crowds In S.C. : It's All Politics Just a few weeks ago, many GOP voters said they wanted a new face, a nontraditional, outsider candidate to take on Obama. But after studying the Republican lineup, many now say they want someone who knows the system. 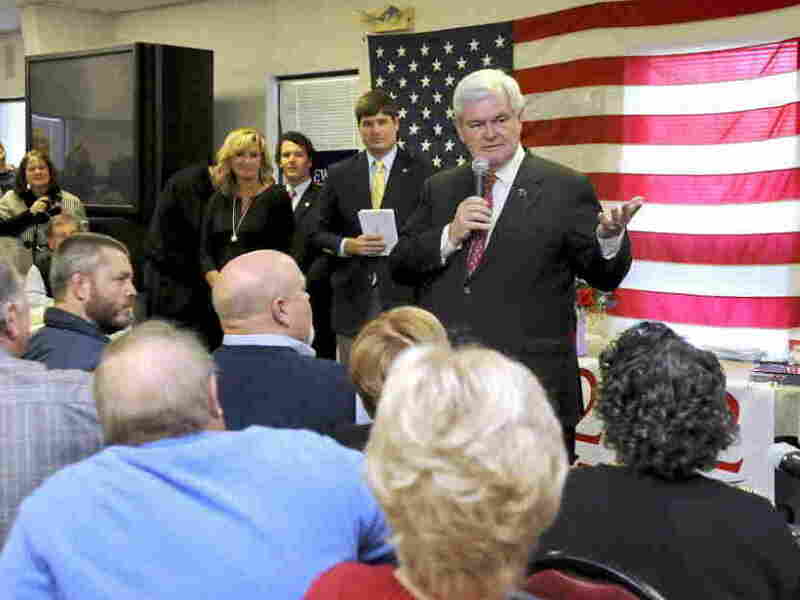 Republican presidential candidate Newt Gingrich addressed large crowds at campaign stops like this one at Tommy's Ham House in Greenville, S.C. on Wednesday. Newt Gingrich traveled across South Carolina this week appearing at a number of town-hall-style meetings where he talked to voters and answered questions — mostly the same questions at every stop. He talked about the improving the economy, creating a new immigration policy, repealing President Obama's health care reform plan and transforming Washington. Gingrich himself said he was surprised at the size of the crowds that came to see him. Every venue — from coastal Charleston to tiny Newberry and Greenville further inland — was packed with hundreds of GOP faithful wanting to meet the candidate and wondering if he can lead the party to victory in 2012. The crowds have been supportive of the former U.S. House speaker — even jubilant. This is a very conservative state and an important one: it holds the first primary in the South on Jan. 21. One voter told me that although Gingrich is not the most conservative candidate, he probably could get the GOP nomination. Voters don't seem bothered much by his past indiscretions, including his three marriages and the more than $1.5 million he received as a consultant from mortgage giant Freddie Mac. Most voters said those things shouldn't be an issue. The candidate himself admits he's not perfect and people appreciate his candor. Gingrich jokes with audiences while still making his point that he thinks President Obama is a radical who needs to be replaced — a line GOP crowds love and greet with resounding applause each time they hear it. While Gingrich has been seen as a bit aloof in the past, he's now embracing voters in places like Tommy's Ham House in Greenville, SC., a famous breakfast hangout for politicians and regular folks. He avoids controversy, not talking much about Herman Cain and whether he should stay in the race. 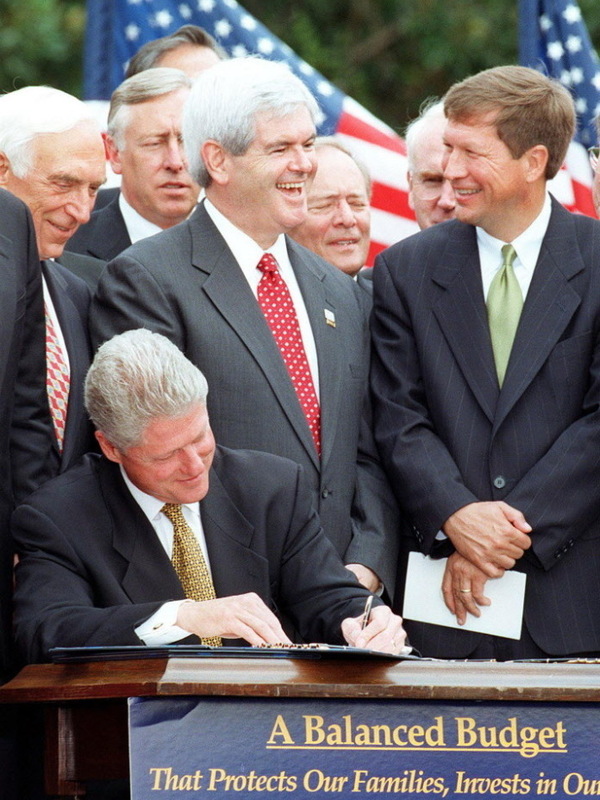 House Speaker Newt Gingrich talks with Rep. John Kasich of Ohio while President Bill Clinton signs the Balanced Budget Agreement on the South Lawn of the White House in 1997. Gingrich says he's learned to be positive. He didn't lose hope earlier this year when the media counted him out in June. After all, he's used to soldiering on: Gingrich ran for Congress three times before he was elected in 1978. Just a few weeks ago, many GOP voters said they wanted a new face, a nontraditional, outsider candidate to take on Obama. But after studying the Republican lineup, many now tell me they want someone who knows the system — someone who can work with Congress. They point to Gingrich because they say he was able to work with President Bill Clinton in the 1990s on welfare reform and a balanced budget. Responding to a question from a voter who asked about that cooperation, Gingrich also noted that sometimes you have to take a stand. He says that's what he did when the Republicans shut down the government in 1995. But he said it worked and everyone eventually had to compromise — without abandoning their core principles. Many voters here say Gingrich is a better fit for South Carolina voters than his GOP rival, Mitt Romney. Polls in South Carolina suggest that it may, indeed, come down to a choice between the two. One poll released on Tuesday showed Gingrich leading with 33 percent of the vote, followed by Romney with 22 percent and Cain with 10 percent. Gingrich told crowds this week he needs South Carolina to win the GOP presidential nomination and he promised to return to court voters often before the January primary. So far, his pitch seems to be working.